HMS Mersey is a River Class Offshore Patrol Vessel, one of four owned by the Royal Navy. She was launched in 2003, and is the youngest of the River Class built for the Fishery Protection Squadron. She and her sister Ships, HMS Severn, HMS Tyne, patrol the waters of the UK and up to 200 miles off shore working with the Maritime Management Organisation, ensuring that fishing boats and trawlers adhere to UK and EU fishery regulations and quotas. Her adapted sister Ship HMS Clyde (which includes an added flight deck) is permanently deployed as the Falkland Islands Patrol Vessel, monitoring the local waters and airspace whilst conducting routine visits and providing reassurance to the many small settlements found throughout the Islands. 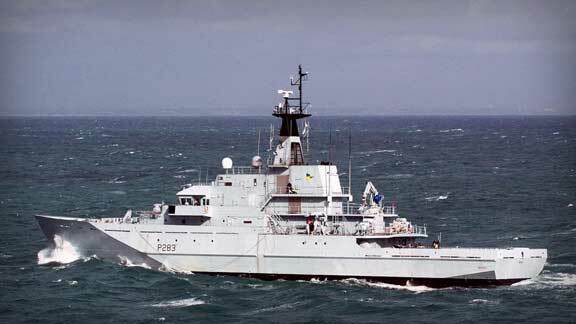 HMS Mersey is a highly maneuverable and versatile vessel. She can turn rapidly and come to a complete stop at sea within 276 yards (or 43 seconds) when travelling at 21 knots, extremely useful when working in inshore waters and in close proximity to fishing vessels. Based in Portsmouth, HMS Mersey is a regular visitor to UK ports and often invites groups on board to demonstrate the capabilities of the Royal Navy as well as give a taste of daily life on board. She operates a crew rotation system which means that a member of the Ship’s company would normally spend four weeks onboard and two weeks at home or on courses, allowing the Ship herself to be on almost constant patrol. The Company has been associated with HMS Mersey since 2008. In Spring 2009 the then Master and Commanding Officer signed a memorandum of understanding which confirms that the aims of the association include the promotion of the well-being and interest of the Ship and to provide such assistance and support ‘as might be desirable and practicable’. Each Commanding Officer is elected as an Honorary Freeman of the Company for the duration of their service in MERSEY and the CO each year nominates a member of the crew to receive the ‘Sailor of the Year Award’.